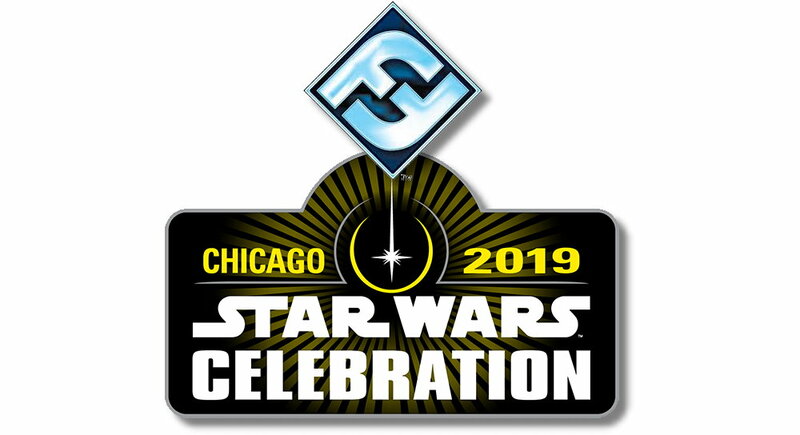 Star Wars fans will soon descend on Chicago for Star Wars Celebration, and FFG will be there to satiate gamer’s needs. Check out their full schedule here! 1:00pm: X-Wing Furball (Room #W184BC). Includes participation card and prize card for each day’s winner. 1:30pm – 2:30pm: Darren Tan will be signing his exclusive Star Wars Celebration art print (Booth #4018). 3:30pm – 4:30pm: Live Star Wars™: Legion painting tutorial with Sorastro, from Sorastro’s Painting (Booth #4018). 4:00pm: Imperial Assault campaign (Room #W184BC). 4:00pm: Star Wars RPG, Edge of the Empire scenario, “Unwelcome Arrival” (Room #W184BC). 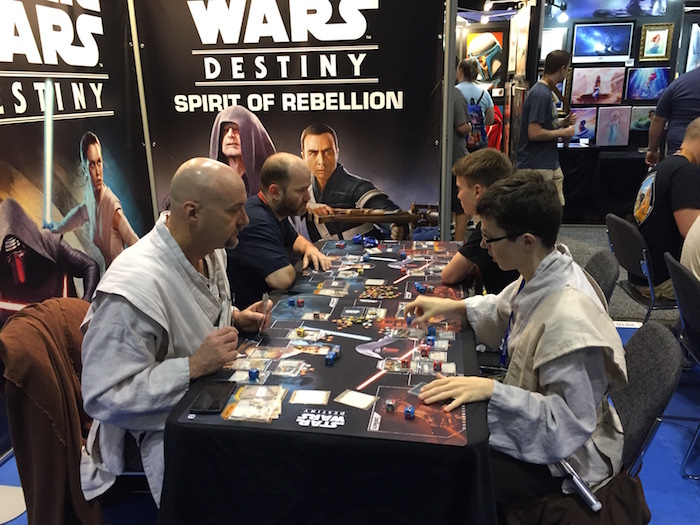 5:30pm – 6:45pm: “Make Your Own Promo Card” – put yourself in your very own Star Wars: Destiny promo card (Booth #4018). Open Play: 1pm to 10pm in Room #W184BC. Guests can check out any of our Star Wars games and play. Paint & Take: 1pm to 8pm, Booth #4018. Stop by our booth and learn to paint your very own Star Wars: Legion miniature. 10:00am: X-Wing Furball (Room #W184BC). Includes participation card and prize card for each day’s winner. 10:00am: Imperial Assault campaign (Room #W184BC). 10:00am: Star Wars RPG, Edge of the Empire scenario, “Unwelcome Arrival” (Room #W184BC). 10:30am – 12:00pm: “Make Your Own Promo Card” – put yourself in your very own Star Wars: Destiny promo card (Booth #4018). 11:00am: X-Wing Hyperspace tournament, including assorted prizes (Room #W184BC). 12:00pm: Star Wars: Destiny standard tournament, including assorted prizes (Room #W184BC). 12:30pm – 1:30pm: Darren Tan will be signing his exclusive Star Wars Celebration art print (Booth #4018). 2:00pm – 3:00pm: Brian Rood will be signing art prints (Booth#4018). 3:30pm – 4:30pm: Live Star Wars: Legion painting tutorial with John Shaffer, head of the FFG miniatures department (Booth #4018). Open Play: 10am to 10pm in Room #W184BC. Guests can check out any of our Star Wars games and play. Paint & Take: 10am to 7pm, Booth #4018. Stop by our booth and learn to paint your very own Star Wars: Legion miniature. 11:00am – 12:00pm – Fantasy Flight Games panel discussion (Twin Suns Stage). 11:00am: X-Wing extended tournament, including assorted prizes (Room #W184BC). 12:00pm: Star Wars: Destiny infinite tournament, including assorted prizes (Room #W184BC). 2:00pm – 3:00pm: Chris Trevas will be signing art prints (Booth#4018). 3:30pm – 4:30pm: Live Star Wars: Legion painting tutorial with Sorastro, from Sorastro’s Painting (Booth #4018). 5:30pm – 6:30pm: Learn to paint Star Wars miniatures. Join Sorastro and John Shaffer as they take you through the basics of painting a Stormtrooper from Star Wars: Legion (University Stage). Open Play: 10am to 4pm in Room #W184BC. Guests can check out any of our Star Wars games and play. Paint & Take: 10am to 4pm, Booth #4018. Stop by our booth and learn to paint your very own Star Wars: Legion miniature.